I finished the first art commission that caused me to put the site on pause for a while, but just had to start another one. I probably won’t be able to have another update for another month after this one. 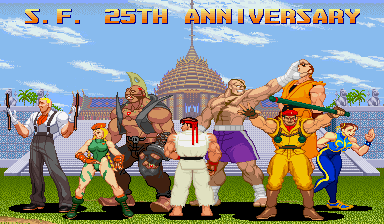 I made a little Street Fighter 25th anniversary update between commission jobs to prove that I’m still around. This site isn’t supposed to focus on fighting games, but Street Fighter and Final Fight share the same world and that’s my excuse. Over a dozen backgrounds from different Street Fighter games were added to the “384×224 scenes + text” in the GroupShot Generator. 8×16 font from Super Street Fighter II Turbo added to font-enabled styles in the GroupShot Generator. Custom Sprites – The Capcom page was updated with the new Rolento edit added to the Final Fight section. Ryu and Cammy edits added to Street Fighter section. Every Move is Special – The plan is to host a special event and all-around celebration of both Street Fighter and fighting games as a whole. See previews of the artwork and more on the project’s Tumblr. This looks like it’s going to be a really cool book and possible event, so I’m really rooting for this one. Mercenary Kings – The same crew behind the excellent Scott Pilgrim vs. the World beat-em-up are working on a side-scrolling platform shooter that harkens to many 2-D classics while adding the ability to make your own weapons and gear. Check out the website for more details and watch this video to see what kind of game they’re going to hit us with in 2013.